Lighthouse Trails recently posted a letter to the editor written by a woman who is concerned that Dallas Theological Seminary, known for, among other things, biblical inerrancy, has invited a Word of Faith heretic to speak at a women’s conference. 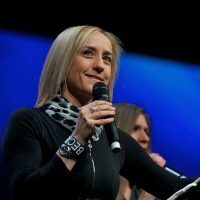 LHT points out that the reason Christine Caine should not have been invited to speak at any evangelical seminary is because “she claims Joyce Meyer as her ‘spiritual mother’ and lists Word of Faith preacher Sheryl Brady as a dear friend calling her ‘flat out the best chick preacher of the word.’ Caine has ‘preached’ in seeker/emergent Steven Furtick’s mega church in Charlotte, North Carolina.” More about Christine Caine here. Thank you for the article regarding Dallas Theological Seminary’s movement toward contemplative prayer and the New Spirituality. It was painful to read as I have relied upon their faithfulness to the Word since 1974 when I first sat under the teaching of a DTS graduate. All the teachers I listen to and know have graduated from DTS. There are many graduates here in _____, Texas and true verse-by-verse teaching has had an influence upon so many who love the truth. I have been able to discern a change even in the teachers I sit under as I hear who they quote in their teachings.